Boss cut his teeth with Ulster and made his Ireland bow against New Zealand in Auckland in June 2006. And he pushed on from there over the coming years but was used largely as an impact substitute having started just four of his 14 appearances in an Ireland shirt. 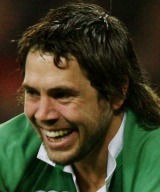 After announcing his move to Leinster in time for the 2011-12 season, Boss will first go to the World Cup with Ireland. He only made one apperance in their four warm-up Tests prior to the competition, but he clearly did enough to be included in the 30-man squad. With Eoin Reddan in front of him however, he will need to be playing at his very best to force his way into the first team.